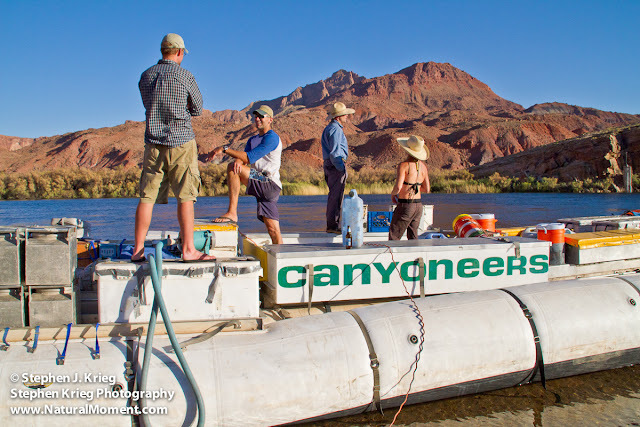 Our June 2011 oar trip put-in on the Colorado River at Lees Ferry on June 14. The boats are put into the water, rigged up, and loaded with supplies. The river guides then camp out that night, and everything is ready for when the passengers arrive the following morning. Our June and August oar trips have motorized support, meaning that one of our big 37-foot C-Craft boats goes along. This has the advantage of being able to carry a lot more fresh and frozen food. The big boat does not mix in with the smaller 16-foot Avon rafts. It either goes ahead or lags behind, so that the passengers in the oar boats have a motor-free experience. Another advantage of having it along is that, if anyone is uncomfortable going through the big rapids in the smaller rafts, they're always welcome to go through them on the big boat. Evening at Lees Ferry is spectacular. The lower the sun gets, the warmer the cliff colors become, reflecting off the blue of the Colorado River. In this photo, Cliff Ghiglieri, Drew Houser, Greg Reiff, and Cassie Micheli chat while rigging the C-Craft.